Every Tuesday at 9.45 there now are Jolly Babies & Music with Mummy sessions at the White Hart. These are for the under 3's, with either parent, and the aim is to encourage listening skills, use of simple instruments with music that is fun! It's organised in small and friendly groups with singing and rhythm through movement. A ceremony was held on Tuesday 21st March to mark the start of work on the new community hall for Whitchurch. Whitchurch Councillor Alison Wall, Portfolio Holder for Leisure & Culture on Basingstoke & Deane Borough Council, announced that the building is to be named The Gill Nethercott Community Centre. This commemorates Councillor Nethercott’s role in ensuring that the project is happening, starting with a Community Profile for Whitchurch 15 years ago. Gill Nethercott announced this week that she is standing down from the Borough Council because she is no longer physically able to fulfil her duties. Gill was diagnosed with Motor Neurone Disease in 2004. 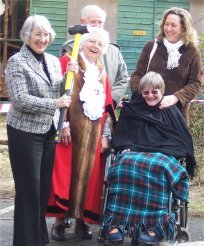 Picture, left to right: Alison Wall; Irene and Ken Clark, Town Mayor and consort; Gill Nethercott; Harriet Titcomb, Vice-chair of the Whitchurch Association. WHITCHURCH GETS A SPRING CLEAN! Did you see the teams of workers around the Town on Wednesday 22nd March? Basingstoke and Deane Borough Council in collaboration with the Town Council blitzed the Town Centre and some of the surrounding roads and footpaths today in a mass clear up. The residents of some roads were forewarned, and were asked to move their cars, so that the gutters could be properly swept. In other areas hedging and shrubberies were trimmed to make it easier to clear litter, and assist our own hard-working Litter Collector. It is hoped that the exercise will not only make Whitchurch tidier, but will make those who drop litter aware of the impact of their actions. If successful, the exercise will be repeated in the future, and it is hoped that members of the public will come out and support the effort, by letting the Town Council know of problem areas, and perhaps giving a helping hand for an hour or two. With a little effort, we can make Whitchurch a smarter, cleaner place to live. Bere Mill gardens will be open for the National Gardens Scheme on 26 and 27th March from 2 am - 6pm. The garden is a fascinating Japanese scroll type garden and runs between the Test and carrier streams around the old Mill build in 1712. It comprises herbaceous and Mediterranean beds, a walled garden, a Wisteria garden, a lake and a Japanese tea-house. Admission is £3 for adults and free for children. Plants grown at the garden will be available for sale. The long awaited Hampshire County Council Heavy Goods Vehicle (HGV) survey report has now been printed and is available for inspection at the Town Hall. A condensed electronic version (PDF) is also available here on the website (click here). This is a technical document so Tony Corbin has produced an introduction which you might like to read first, it is here. Tony's introduction's main points are that, despite their very visible presence, there are not large numbers of HGVs, compared with other areas of the country, although the size of individual vehicles is on the increase. Further, the vast majority of the HGVs are involved in local deliveries. Given these findings the chances of any external funding for improvements are low, but Tony has identified 6 potential local improvements, tourist signs that point out the narrow winding streets, realigning the lorry sign on the A34, forced routing of vehicles to Evingar Road via Lichfield off slip, traffic lights at The Square, additional pedestrian crossings and educating companies whose vehicles pass through the town.